with your one, precious life? We all have dreams, adventures, and wishes for our lives — but how do we get them? Not that abandoned New Year’s resolution list, but actually switching careers? Actually taking that nice vacation? Actually having enough for retirement? In the past decade, I’ve focused on this exact question — and I’ve found a powerful answer. It’s straightforward. You look around your life, decide where you want to go, create a plan for the next two years, and then move towards it. Two years later, like magic, you’re there. I’ve watched people use it to start businesses, change careers, and get out of debt. It’s a simple concept, that simply works. But like most really effective things, the secret's in the details. Over the years, I’ve crafted and honed a set of exercises based on neuroscience, psychology, and what we know about how our brains work. Exercises to explore and understand what we really want. The steps to make a plan that motivates and guides us to where we want to go. The tools to make consistent progress and stay on track, regardless of what life throws our way. I took all of those tools and put them into a step-by-step, easy-to-follow system anyone could do from their couch. This masterclass is the result. Over the last few years, I've been able to watch my clients go through this process and transform their lives. Seen them go after — and get — some of their biggest dreams. And I want the same thing for you. For you to spend your days on the things you care about the most. For you to have the confidence that you can take on any goal — and know that you can get there. This course has everything you’ll need to make your next two years amazing. “Steven is a magic worker. I have always shied away from traditional goal-setting and life planning exercises. They feel fake and contrived and I inevitably forget about them a few weeks after finishing (oops). Not so with the Two-Year Life Plan! You want to build a life that you love, around the things that you care about. You're looking for a clear direction to take your life. You want to explore what's really important to you. You've struggled with resolutions and goals that never quite get met. You want the tools and skills to really hit your goals. You're already exactly where you want to be in life. You have no trouble setting or achieving your goals. 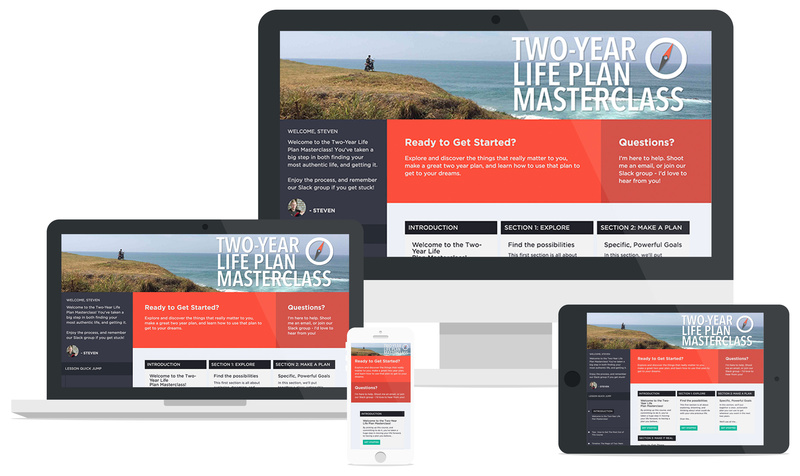 The Two-Year Life Plan Masterclass is a 25-module, self-led course that will give you a clear direction for your life. It will guide you through exploration. Uncovering what you really value, thinking through your big dreams, your relationships, and every aspect of your life. It will help you make a plan. A set of clear goals for the next two years that reflect who you are and what you want from your life. And it will give you the tools to get there. Show you how to use that plan in your day-to-day life, so it doesn’t become another discarded “resolutions” list. The system works, and I’ve used it with clients and based my own life around it for most of a decade. ​I'm thrilled to be able to put it in your hands. I've kept busy making the most out of my life. I've founded six companies, worked on global campaigns for Nike and Coca-Cola, run an art series, picked up an engineering degree from an Ivy league school, run writing workshops in prisons, led published medical research, worked with ethnobotanical field teams in Peru, started a dozen open-source projects, and given a TEDx talk on changing the world. If that seems like a crazy list, that's because it is. See, I’m obsessed with making the most out of life, and I’ve spent a lot of time figuring out how we can each do just that. As individuals, how can we become the people we want to be? As a society, how can we create a world we want to live in? This course is my answer to that first question. The truth is, I'm a normal person, just like you. I'm not smarter or better or more connected. I've just figured out how to organize my life to go after the things I want – and I want to share that with you. A 25-module, step-by-step course that guides you through exploration, making a plan, and putting it into action. Nine proven exercises that enable you to explore and understand your values — and what you really want out of life. They include my very favorite question — a deceptively simple one that dramatically shifts our thinking on what’s possible. Step-by-step instructions on turning those value explorations into actionable, powerful goals — your two-year life plan. I include the most important step in creating effective goals that I’ve found with my clients — the one that makes the biggest difference between success and failure. You’ll be guided through how to use your two-year life plan monthly, weekly, and daily in your actual life, so you really get there. All the insights I've picked up helping people stay motivated and stay on track are in here. You get everything. Online, 24/7 access to the entire course, for life. You'll get access to our Slack community — filled with people who are also creating and following their two-year life plans — to inspire you and help you get unstuck. You’ll be the one changing your life — and you won’t be alone. When I do this work one-on-one with my coaching clients, the cost is between $1,200 and $2,000 dollars. It’s worth it, but that price isn’t accessible to everyone. But I want this course to be affordable to everyone, so I’m pricing it at just $197. I’m so sure you’ll find the class valuable that I’m backing it up with a no-questions-asked guarantee. If you don’t love it, just email me personally at [email protected], ask for a refund, and I’ll send you your money back. Simple. This is your one precious life. 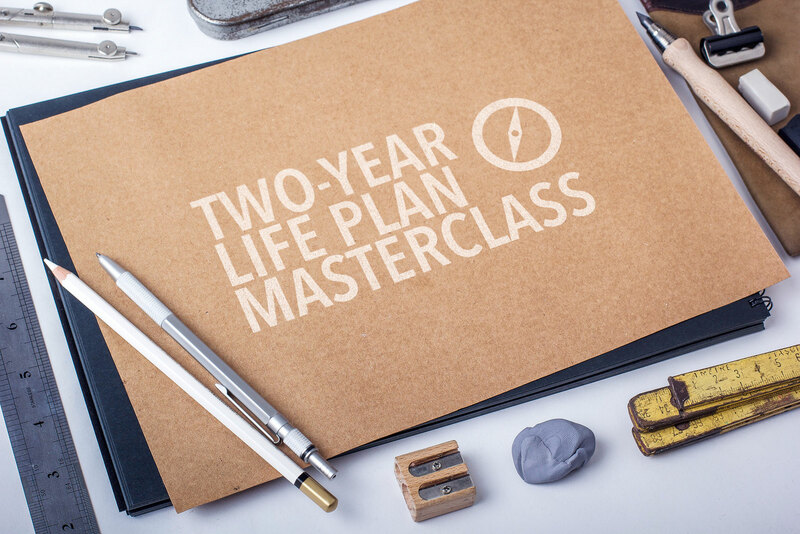 Get the Two-Year Life Plan Masterclass. A 25-module course that guides you through exploration, making a plan, and putting it in action. 9 proven, mind-opening exploration exercises to give you clarity. Guided lessons on creating powerful, actionable goals. Insights on how to use your goals, so you actually reach them. Online access, 24/7 to the entire course, for life. Access to the Slack community of people changing their lives just like you. Money-back Guarantee: If this course doesn't get you clarity on the things you care about, inspire you, and get you moving toward the life you love, just email me and I’ll refund your money. No questions asked. “If you’re going to bet on something — bet on yourself.